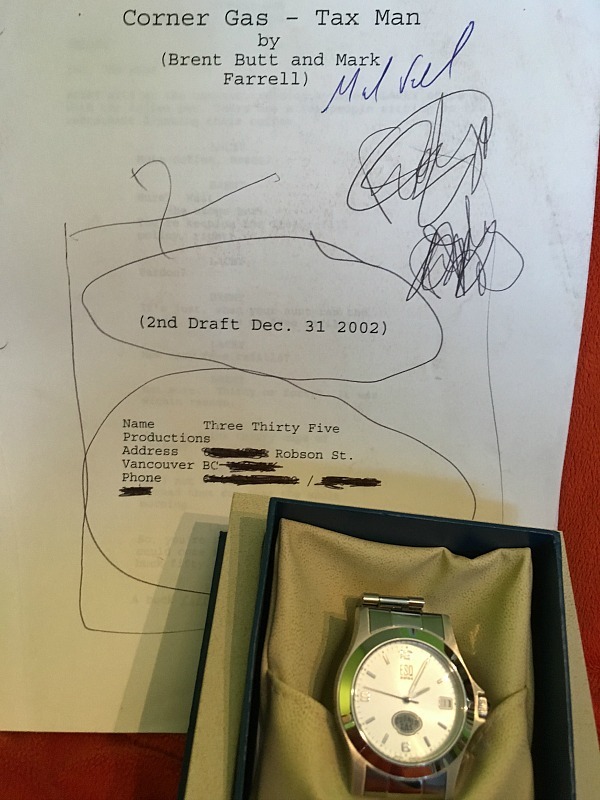 Kids Help Phone Auction: Corner Gas watch & signed script | TV, eh? Corner Gas watch and script signed by producer Mark Farrell. Donated by Mark Farrell. For the bidding, is there an incremental limit? I tried to bid more for one of the items, but the app only allowed me to raise it by $10.00. Is this by design? If so, would be good to have that in the instructions or a note somewhere? The previous comment was from actions I took from my Ipad. Once I moved over to a PC, I was able to make a higher bid. Curious. Thank you. That is curious. Glad you got things sorted out and thanks for your support! Greg – Sent you the same question in Twitter. What time does the auction close today (Sept 30)? The poll closes at 11 a.m. ET. Good luck! Hi Again – found the answer at the top in the introductory info. Auction ends at 11:00.